I’ve never been to a place where you could walk right into traffic. At first glance Hanoi seems chaotic. But I soon realize there’s an order to this chaos, a calm in this chaos. There are constant well-orchestrated streams of cars, motorbikes and cyclists, some weighed down with large bundles of flowers or fruit. As a pedestrian you cross through the traffic, without waiting for the flow to stop, because it never does. Sidewalks are not reserved for walking. They are full with low plastic restaurant stools and parked motorbikes, leaving not enough room to squeeze by. There are groups of men, rowdy with beer, women tending to their broths, endless cafes - people gathered everywhere, sitting, facing the street. It seems so social, their eating and drinking moments of the day. We walk - a lot. We see whole lacquered (dead) dog for sale beside a pile of its intestines. We see live eels in a plastic basket, larvae, pecking hens in mesh bags, piles of fruit. Women in their conical hats balancing wide baskets on their shoulder like a scale. We try a banana-leaf-wrapped sticky rice snack. We get ripped off buying a Vietnamese version of Timbits. 30 000 dong (about $1.70) for 6, which we realize is unreasonable (after handing over our money). We buy a Vietnamese espresso-maker for not much more than the Timbits. We eat soup with noodles, tofu and tomato for less than the Timbits. We have coconut coffee, way-too sweetened with condensed milk for about the same price as the Timbits. I get a wonderful massage at a spa that trains and employs blind people. My masseuse is a single mother from a tribal community outside Hanoi. She has small knowing hands and a delicate but precise touch. The massage room is warm and cozy and smells like lemongrass. They serve me a rich and perfumed tea before and after. The experience lasts just over an hour, costs $17, and feels like a luxury, an indulgence unwinding me from the 26-hour cramped sleepless journey from Moncton. Hanoi is surprisingly un-touristy. We don’t see many foreigners around. It’s local life lived on sides of streets, some of it unbelievably old-world. There are weathered french colonial buildings stacked up high, charming narrow streets busy with commerce, the unrelenting noise of traffic, smells good and bad, moist and heady. Despite all the action, the locals are relaxed. They don’t stare, even though I know we stand out. We go on a free food tour with Van, a 21 year old student of linguistics. 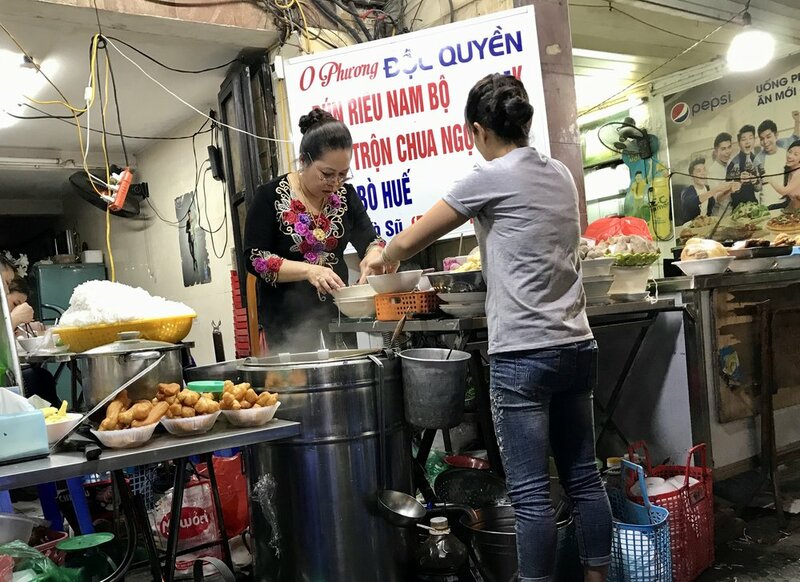 She takes us to eat bun cha - small pork patties in a broth with rice vermicelli and a side of flavourful herbs. With it, I drink rice wine - strong, smooth and a bit lemony. We go to other side-of-the-road neon-lit establishments - one for sticky rice with mushroom and chicken (xoi yen), another for rice-paper rolls (banh cuon) and one more for exotic fruit with yogurt (che ngon). I eat a lot and feel slightly comatose as Van leads us through the busy night streets of Hanoi. She orders for us, making it easy. The Vietnamese language seems so foreign but I’m starting to get used to its bounce and punch. I learn how to say hello (xin chao) and that seems like a big accomplishment. Tomorrow maybe I’ll remember how to say thank you. Hanoi grows on me. It’s a city of contrasts with its sidewalk shrines aflame, its jumble of hanging laundry and electrical wires, its elegant high-heeled women on motorbikes. It’s a fascinating place and our introduction to Vietnam. I can’t wait to see what’s next.